Try a new game to help with pronunciation and articualtion. A key process for learning reading and writing skills. It's a great game to encourage construction of simple sentences with the use of magnetic picture symbols. This speech therapy material can be used from the early childhood and is suitable for children of preschool level with a typical development or showing speech delay. EACH BOOK CONTAINS 24 EASY-TO-HANDLE PIcture symbol PIECES TO RETAIN THE CHILD'S ATTENTION during the speech therapy exercices. They represent the key structure elements of the sentence to build. The magnetic pictogram help maintain the child's attention, but they also let the reader offer the child multiple options and to make the sentence's key elements more tangible. Why not use them for other game or situations of the every day life? The books have a spiral binding so that emphasis is put on only one page at a time. The sentence's main elements are illustrated with pictograms, which encourages the child to participate in the reading. The vocabulary of the sentence's different elements is taken from a high frequency word bank for young kids. The opaque magnetic strip allows to vary the difficulty level by covering the pictograms. This gives the child the possibility of constructing a sentence to then compare with the expected answer. Have a look at our articulation app and sentence games. These games have helped hundreds of children with speech delay, apraxia of speech, autism and other language disorders. Caroline Martin is a speech therapist. She's been working in a rehabilitation centre which has brought her to develop an expertise with children presenting special needs like mental retardation, autism spectrum disorder, dyspraxia... It is with joy that she shares with you her speech therapy material and her clinical approach to help young children develop language and communication. 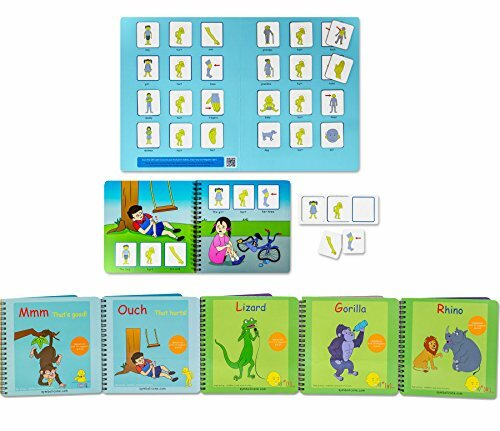 5 Magnetic Gamebooks for speech therapy exercices and language development.